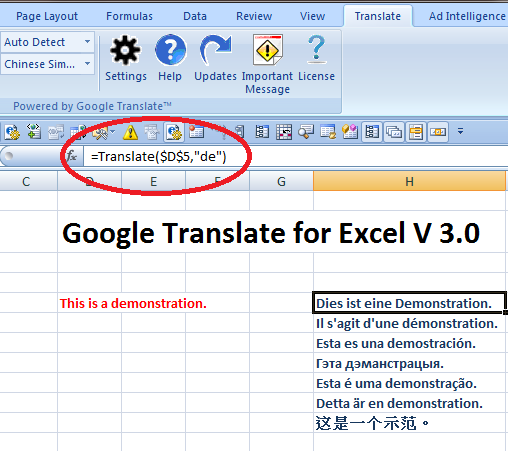 Google Translate for Excel - This Add-in adds a brand new custom functions in your Excel® sheets which will help you easily translate the text of strings from one language to other. The functions are very straightforward to use, and you can use them like you use any other inbuilt Excel functions. You can use either the Google translate API or the Microsoft Translator API and connect Microsoft Excel directly to their services. You pay to the service provider of your choice directly for translations. Not only you get access to the translation formula, but also you get access to a menu system specifically designed to ease out the translation tasks. With the menu system, all you have to do is click a few buttons to translate the full workbook, a full sheet or a range of selected cells. If you are translating Multiple Cells at one go, then you will find this plugin extremely useful and time saving. You will be able to use Excel functions to translate multiple cells at one go. We have taken care of many nuances that are generally accompanied by translating complex workbooks. For example, taking care of different encoding styles in various languages, taking care of the special characters, translating text in Excel objects like the comments, boxes and so on. This add-in makes it easy for your Excel sheets to directly connect with Google or Microsoft's API in a very user-friendly way to translate the texts. We are proud that our add-in has been downloaded more than 19 thousand times on CNET. With our menu system, all you have to do is click a button and translate the full Excel workbook from one language to another. With the power of Google's machine learning translation engine you can be assured that translations are good. Use new custom functions like =Translate(cell,"fr") if needed to translate specific ranges of cells. The functions are just like normal Excel functions. Refer to the cells that have the original content. This add-in directly connects your sheets with translation service providers, i.e., Google or Microsoft. You do not pay us for translation. Your arrangement with service providers is between you and them. Your Excel application directly calls their servers to request translated text. We, however, make the whole process easier, faster and better. Moreover, your API key gets stored on your machine. Translate text within Excel objects on your sheets like comments, shapes, buttons or any other shape, so you do not have to do it manually. Take care of common nuisances like special characters, different encoding formats, and so on with ease. This software will create an Excel function for you to use to translate text in Excel using Google Translate API. How do you access the function? The function is called “=Translate”, you should see that in the function menu in Excel. Or you can simply type this in any cell as you will do with any other function. What are the arguments of the function? This function takes 2 arguments/parameters. Your the text you wish to translate, and the target language. How do I get Google API to use? Does Google charge me for translations? No, this software only works with Microsoft Office installed on Windows machines.